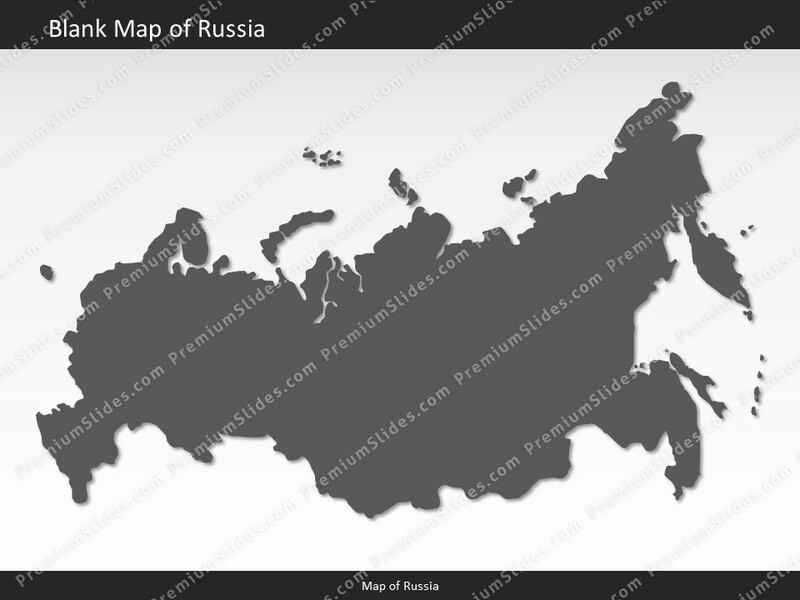 Premium PowerPoint Map of Russia. This detailed PowerPoint Map Template shows Russia states, biggest cities and the Russia state capital. 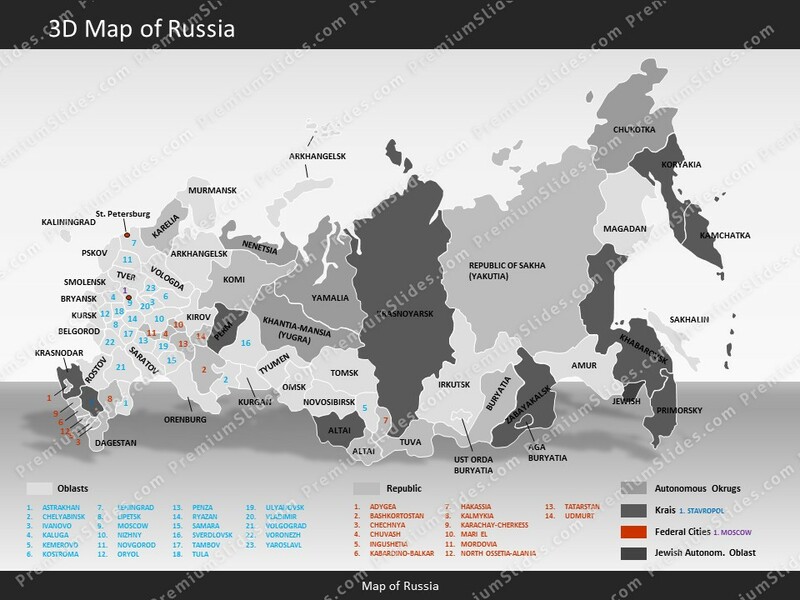 The Russia PowerPoint Map is hand drawn and fully editable in size and color. 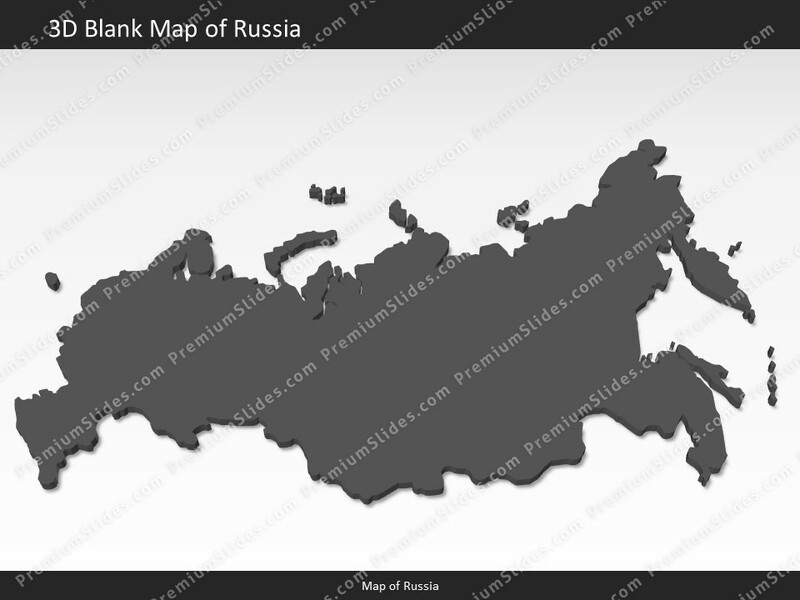 Premium PowerPoint Map of Russia. 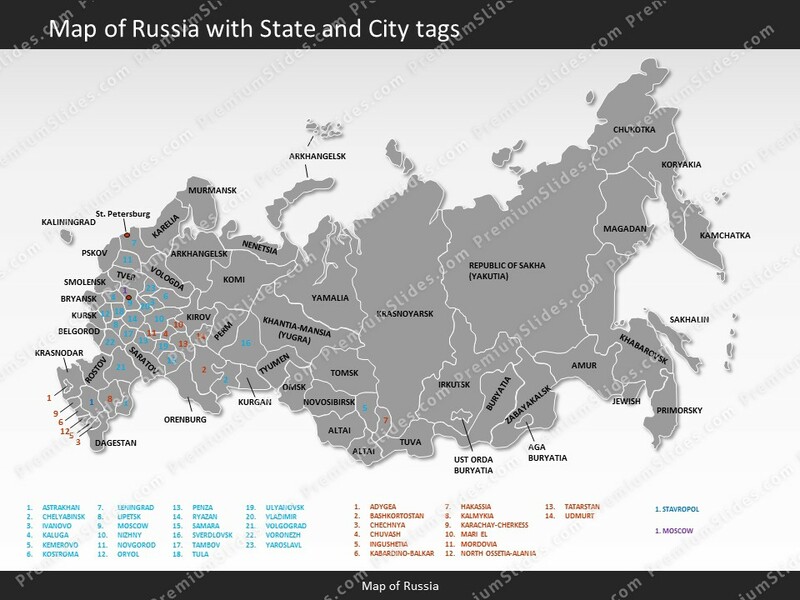 This detailed PowerPoint Map Template shows Russia with states names and biggest cities including the Russia capital.The Russia PowerPoint Map is hand drawn and fully editable in size and color. Every state can be extracted simply. Specific territories can be highlighted easily with just 2 clicks in PowerPoint. 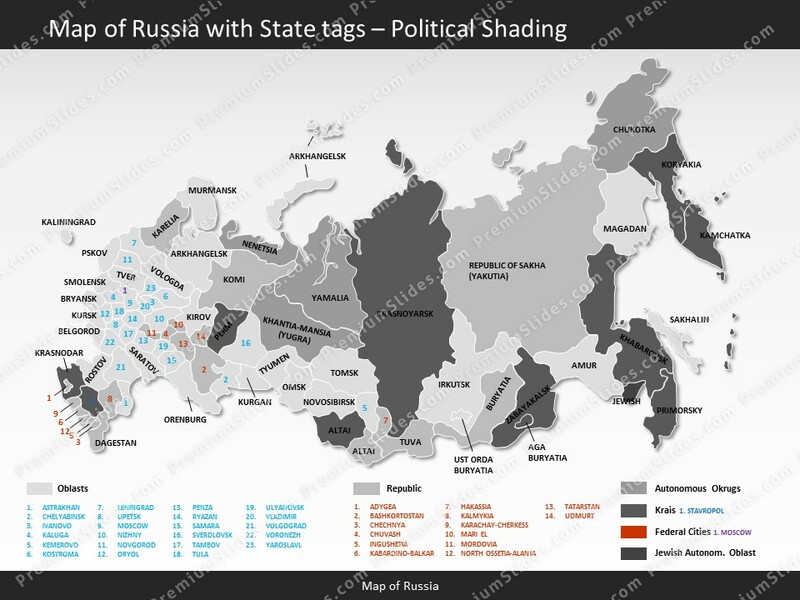 The extensive Map Guide, which is included in this package, shows the easy steps of adjusting the map to your needs.The Russia Map Template is a great benefit for showing different kind of data (e.g. sales) in this country. 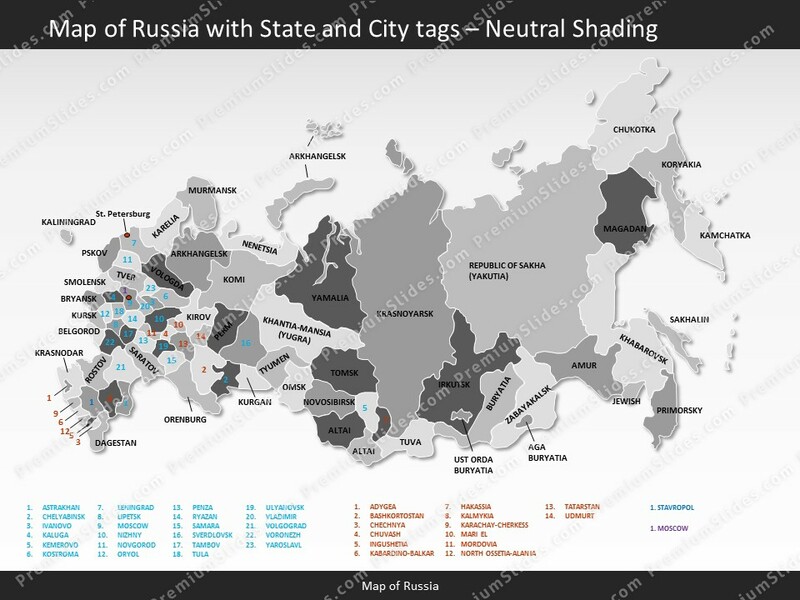 This Russia PowerPoint Map comes in 8 different pre-designed colors and includes map marker icons as well. 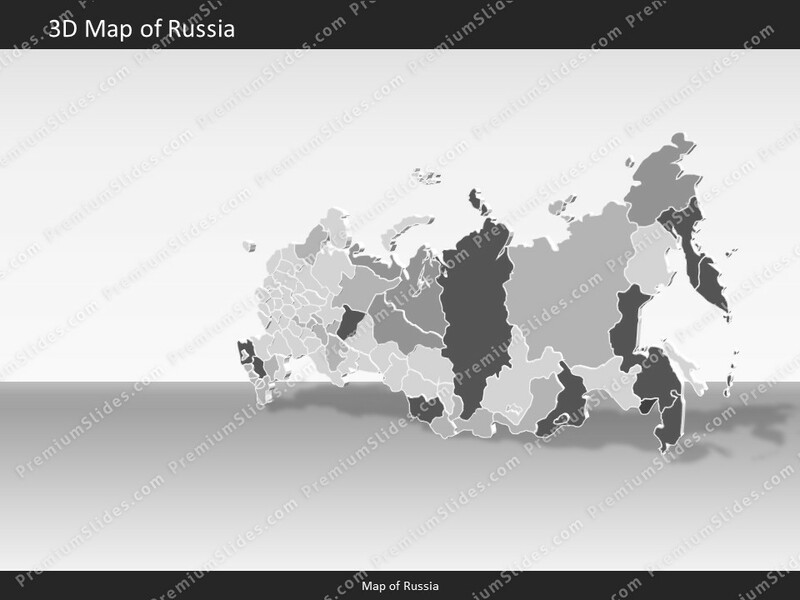 Facts and information about Russia you can use in your presentation. Russia is often referred to as Russian Federation or simply Russia. The locals also call the country Rossiyskaya Federatsiya or Rossiya for short. Russian lands were generally referred to as Muscovy until PETER I officially declared the Russian Empire in 1721; the new name sought to invoke the patrimony of the medieval eastern European Rus state centered on Kyiv in present-day Ukraine; the Rus were a Varangian (eastern Viking) elite that imposed their rule and eventually their name on their Slavic subjects. The country's flag has the colors white, blue, red. The country of Russia lies 60 00 north and 100 00 east. The region has a total area of 17,098,242 sq km with a land coverage of 16,377,742 sq km. About 720,500 sq km is covered with water. Russia has a total border lenght of 22,408 km and is bordered by the following 14 countries: Azerbaijan 338 km, Belarus 1,312 km, China (southeast) 4,133 km, China (south) 46 km, Estonia 324 km, Finland 1,309 km, Georgia 894 km, Kazakhstan 7,644 km, North Korea 18 km, Latvia 332 km, Lithuania (Kaliningrad Oblast) 261 km, Mongolia 3,452 km, Norway 191 km, Poland (Kaliningrad Oblast) 210 km, Ukraine 1,944 km. The lowest point is Caspian Sea -28 m below sea level and the highest is Gora El'brus 5,633 m (highest point in Europe). 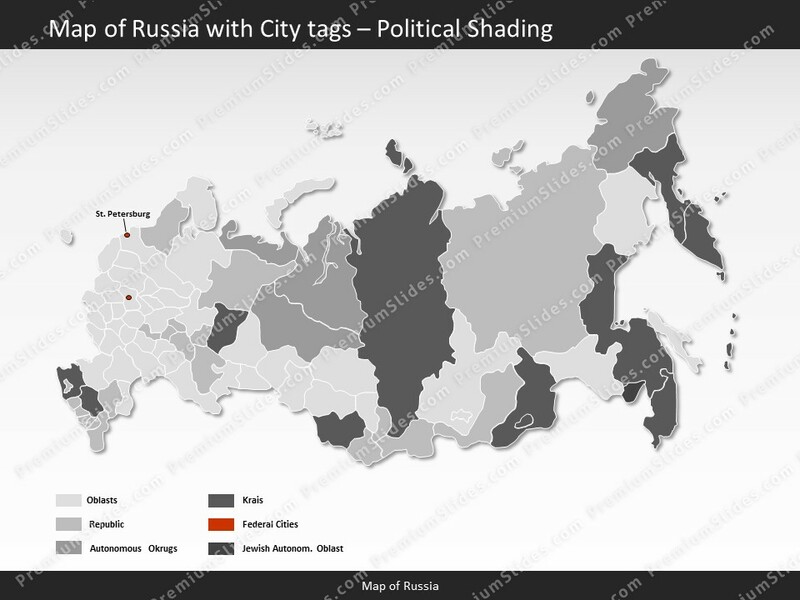 Its mean elevation is about 600 m. Moscow is the capital of Russia and can be found 55 45 N, 37 36 E.
In July 2016 Russia had a population of 142,355,415 people. In 2015, 0,74 of the population lived in cities. The annual growth rate of urbanization is -0.13%. The residents of the country are called Russian(s). The Russian population has a median age of 39.3 years. The median age for males in 2016 was 36.4 years, and 42.3 years for females. The estimated growth rate of the Russian population in 2016 was -0.06%. Looking at life expectancy, the Russian people live an average of 70.8 years (males 65 years, females 76.8 years). Statistically, Russian women give birth to 1.61 children in their lifetime. The estimated gross domestic product in 2015 was about $3.718 trillion, with a growth rate of -3.7% compared to 2014 (GPD 2014: $3.862 trillion, growth rate 0.7%; GPD 2013: $3.834 trillion, growth rate 1.3%). The economic sectors of Russia are: agriculture: 4.4%, industry: 35.8% and services: 59.7% (2015 est.). The country's economy is known for: complete range of mining and extractive industries producing coal, oil, gas, chemicals, and metals; all forms of machine building from rolling mills to high-performance aircraft and space vehicles; defense industries (including radar, missile production, advanced electronic components), shipbuilding; road and rail transportation equipment; communications equipment; agricultural machinery, tractors, and construction equipment; electric power generating and transmitting equipment; medical and scientific instruments; consumer durables, textiles, foodstuffs, handicrafts. 100% of the people living in Russia had full access to electricity in 2016. Among those 73.4% (July 2015 est.) or 104.553 million Russians, had access to an internet connection.